Happy Monday Everyone! I've got exciting stuff going on this week, and I'm kicking it off with a mojo sketch for y'all. I've added an optional layer to this week's sketch for those that want it. You can do it with or without or both, depending on your mood. Okay, here's the drill... just make a card using the sketch as inspiration and then leave a comment on this post with a link to a photo of your creation. There is no time limit - you can play any week at any time, but to be included in the slideshow next Monday, I need your link by Sunday at 8 PM Mountain time (6 PM ET). If you happen to upload to SCS, please use keyword Mojo44 so we can see everyone's mojoliciousness all in one happy place. For my sample card, I used the optional layer as an embossed frame using the largest Rectangle in the Classic Rectangles Nestabilities collection directly on my background layer. The patterned paper for the horizontal strip is from the Hello Sunshine Cosmo Cricket collection, and was my color inspiration for the card. I didn't really have any colors that exactly matched, so I went with a classic black, cream and a splash of color look. The image panel is embossed and cut with Nestabilities and then I stamped one of the large filigrees from Filigree Fantasy and layered a flower and flower center from Petals & Stems over it, popping each layer up on a dimensional. The sentiment is from the Feeling Groovy set and is punched out with a 1.25" circle punch and matted with a 1 3/8" circle punch. To finish I added two photo corner punches, some black grosgrain ribbon and a bunch of Tiny Twinkles from Taylored Expressions. Be sure to checkout the 63 mojolicious entries from last week in the slideshow below! NOTE: If you get a message that says no photos found, please hit the refresh button on your browser or the F5 function key on your keyboard, and hopefully it will reload with the pictures! Hi Julee, love the sketch and your fantastic card. Fabulous looking sketch Julee! Can't wait to give it a go! 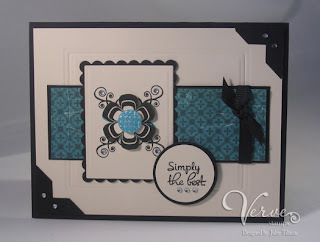 Your sample is gorgeous...love that dry embossing on the middle layer...will need to try that! TFS! Julee, your sketch is fantastic !! Awesome sketch Julee!! Here is mine!! Love the colors in your card, with all the white space and how you embossed the *optional panel*. Great idea!! Great sketch! And your card is so pretty with that cool embossed element, instead of a layer. What a fun sketch!! Hope I'll get the chance to play again!! I tagged your on my blog!! Please play if you get the chance! Gorgeous, Julee! I love the embossed frame on the background panel! Well, HERE is my take on the sketch. Thanks for looking. Fun sketch, Julee! Thanks, and heres my card! OOPS! I misspelled your name... sorry! Great sketch again Julee! My card strayed a bit as I didn't have access to my computer when doing the finishing touches. My rectangle panel is a bit small and the circle sentiment is a bit to the right. Oh well, still works!! Great sketch! I love your blog and I'm actually able to do this weeks mojo! Thanks! So much fun Julee! Thanks for yet another great sketch! Here's my take on it. I finally stopped stalking and entered your challenges. You are fabulous!! Here you can see my Card for this great Sketch! I just ordered some verve stamps - can't wait to get them! Great sketch! Thanks for making the slide show each week. I love seeing everyone else's creations. This was such a fun sketch Julee! I absolutely loved it! :D They keep getting better and better! I didn't have the tab punch so I had to make my own! Haha! Thanks so much! Love the sketch Julee. Woohoo, I made it two weeks in a row! Here's mine. Not quite what I had in mind gonna have to play with this sketch again. Love the sketch, Julee! Here is my card! Love this sketch....I left out the optional panel. Thanks, Julee! I loved this sketch!! I have enjoyed peeking in your blog and seeing all the other wonderful cards in the sketch challenge but always felt a little shy. This sketch looked like so much fun - that I had to try it. Thanks so much for doing these. Hope you are having a great day! Great sketch, Julee. Here's my card to Mojo44. Thanks for another great layout! Julee, I LOVE this sketch. I finally got to play along! :) yay! This is my first entry to your challenge. Love your blog and your style. I do love this sketch too! I think I will have to save this one. That was such a fun sketch! thanks! Love your card, sketch fab. Love your sketches and hope you never tire of providing them! I am so excited that I found your blog this week. Thanks for all the fun. Here is my card. Here is my attempt. Please see my link below. I'm late but couldn't resist this sketch! Thanks, Julee! I'm late but couldn't resist this sketch. Thanks, Julee! I know I'm really late but I JUST LOVE this sketch!! It is one of my fave's to date!!! Here are my cards if you have time to take a peek!! !